Совместный релиз Satanath Records и The Eastern Front: новый альбом "Daevayasna" норвежской black metal группы From The Vastland выходит 25 октября! / Co-release Satanath Records with The Eastern Front: new album "Daevayasna" of Norwegian black metal band From The Vastland is out on October 25th, 2018! После двух лет скитаний в темноте ирано-норвежская black metal группа From The Vastland представляет свой новый долгожданный альбом под названием «Daevayasna» с участием музыкантов из Gaahlswyrd и Den Saakaldte. Фронтмен группы Sina, пройдя по неясному пути, как тень, в одиночестве, передал через музыку все свои чувства. Полноформатник посвящён тьме, демонам и древнему миру. На самом деле это самый мрачный релиз группы. Настоятельно рекомендуется для поклонников Gorgoroth, Marduk, Dissection и старого Darkthrone. Сочинено, записано и сведено в Норвегии, зимой 2018 года. Обложка от Victoria Pelejero. From The Vastland is a Norwegian/Iranian black metal band (started out in 2010 by Sina) and up to now has released 4 full length albums and one EP (especially for the Norwegian documentary film "Blackhearts" where the band is also featured in the film). "From the Vastland" was nominated for the global metal band at Metal Hammer Golden Gods award 2014. They have played in festivals like Inferno metal festival (Nor), Midgardsblot (Nor), Trondheim metal fest (Nor), Southern discomfort festival (Nor), also several other concerts in very special events like the opening act for European music council forum 2018 in Oslo and some other events almost all over the Norway which brought the band a great attention from magazines and websites like Metal Hammer (UK, Norway and Italy), Norway rock magazine, No clean singing, Metal Injection that followed by a lot of success with releasing and distributing their albums via label companies like Indie Recordings (Nor) and Nuclear Blast. Rising from the ashes of the legendary past! 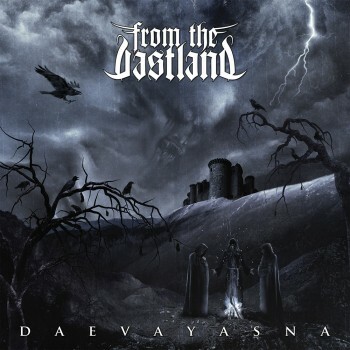 After two years of existence in darkness, the Iranian/Norwegian black metal horde of From The Vastland strike back to present their new highly anticipated full length album entitled "Daevayasna" featuring members of Gaahlswyrd and Den Saakaldte. Sina walked through an obscure path alone, like a shadow, and poured from his deepest feelings into the music. This new album deals with darkness, demons & the ancient world. Indeed this is the darkest of "From The Vastland". Strongly recommended for the fans of Gorgoroth, Marduk, Darkthrone (Old), Dissection. Composed, recorded, mixed and mastered in Norway, winter 2018, by Sina. Cover artworks by Victoria Pelejero.